Happy New Comic Book Day! Image Expo dropped a ton of news for the industry to eat up, especially about their DRM-free digital service. Head on over to Image Comics for more info on that and the rest of their news. Another big event coming up of course is San Diego Comic Con, which is just two weeks away. 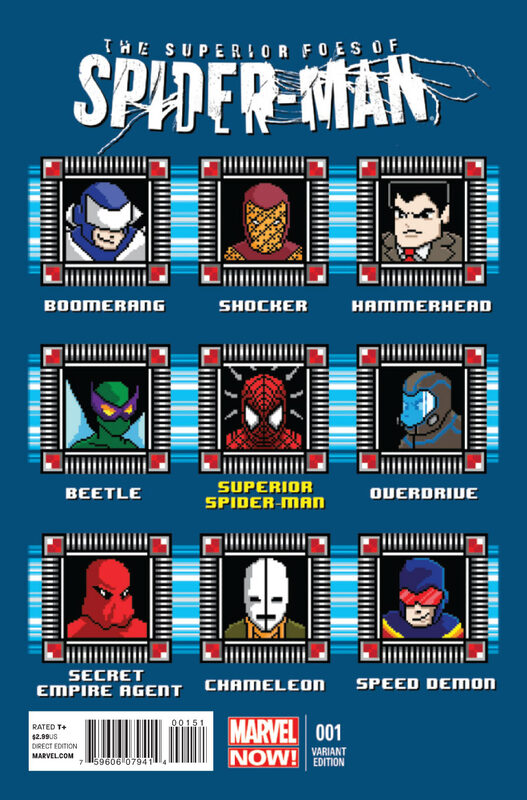 Take a look at Matthew Waite's 8-bit variant cover for Superior Foes of Spider-Man #1. As a gamer and a fan of Mega Man, a.k.a. the Blue Bomber, I absolutely love what Waite did with this cover. Of course while looking at it, I'm just thinking of all the Mega Man games I've played. His old school gaming representations of Superior Spider-Man and a collective of his rogues gallery is perfect. There have been several homages of video games on covers in recent months. For the fans of comics and games, it's a double treat.